Google has made it very easier to quickly find your lost/missing Android device. While there’s Android Device Manager to do the same, many people doesn’t know how to find their device using it (ADM). So it has decided and launched a new feature in Google search that lets users to find their missing device by just typing ‘Find My Phone’ in the Google Search Bar. 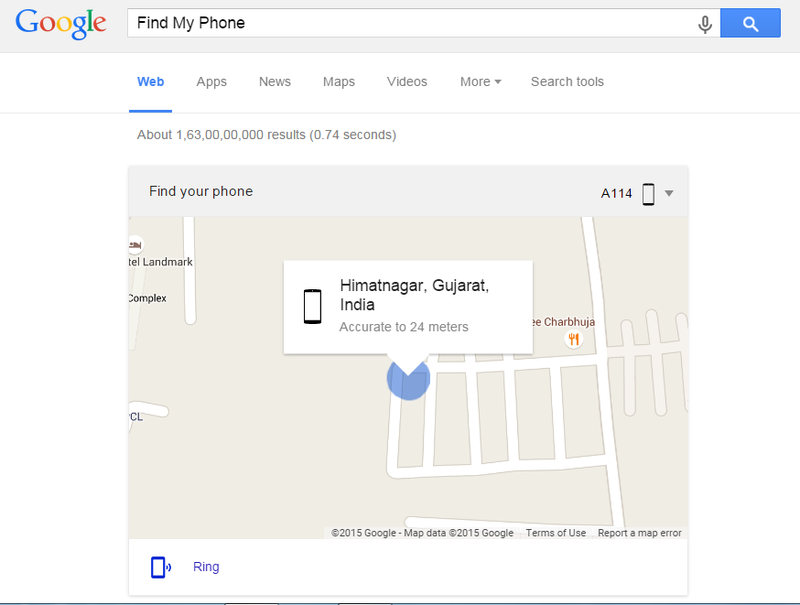 Now Google will automatically find your device and presents you a Google map pointing your device’s current location. From their You can click the “Ring” button to ring your device. This whole process is very simple and its purely made to make easier for normal people. Below is an image demonstrating the simple use of this new feature. Alternatively, You can use Google’s Android Device Manager to Find, Locate, Ring and Wipe your Data Remotely. Note: User’s who wants to use this feature of Google must have the same Google id logged in the device and the computer too. Otherwise it will not work. You just need to login to your Google Id which is also logged in your android device. So what’s your views on this new feature? Isn’t a useful feature? Comment down with your views.